1. Start with a beautifully handcrafted wooden printers block box. 2. Carefully paste sheets of paper that have been aged to perfection in back of each section. 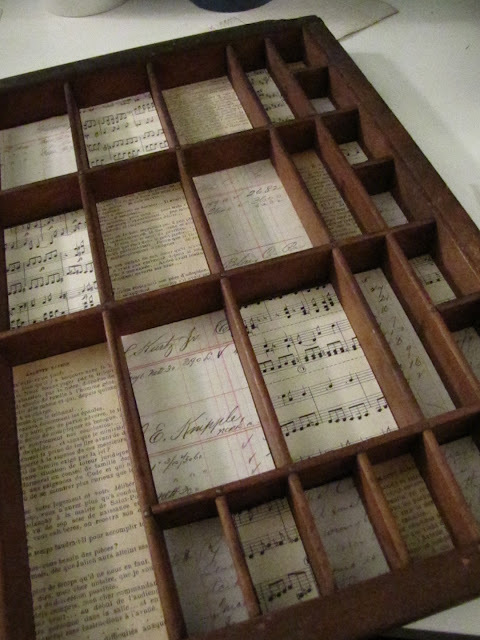 I've used paper from a french novel, ledger book sheets and Parisian music pages. 3. Spend hours rearranging and searching for fabulous vintage treasures to fill up your printers box. Be warned- this can take far more time than you may expect. And remember- not every compartment has to have a "found object" inside. Perhaps some of the contents are little works of art you make as well!! 4. Nonchalantly place items in each slot until they are almost all full. Then take some time to rearrange the items you have selected. Take note of where bursts of color appear and be sure to space them out in a pleasing way. Make sure you're varying the dimensions of items you place side by side. (2-D/3-D specifically). 5. Slowly start to tweak and perfect each little slot, as well as affix your items with adhesives and glue. 6. Check back soon to see my finished results!